The pipeline through which goods flow from supplier to customer – with corresponding payments flowing in the opposite direction from customer to supplier – Route-to-Market (RTM) is a critical aspect of any company’s operations. Putting the right products at the right points of sale in front of the right customers – and all at the right time – is essential. Today, in a globalised market place, Route-to-Market has evolved into a complex multi-channel function, with best practice RTM harmonising the needs and competencies of both the internal and outsourced sales, marketing and distribution operations of an organisation. 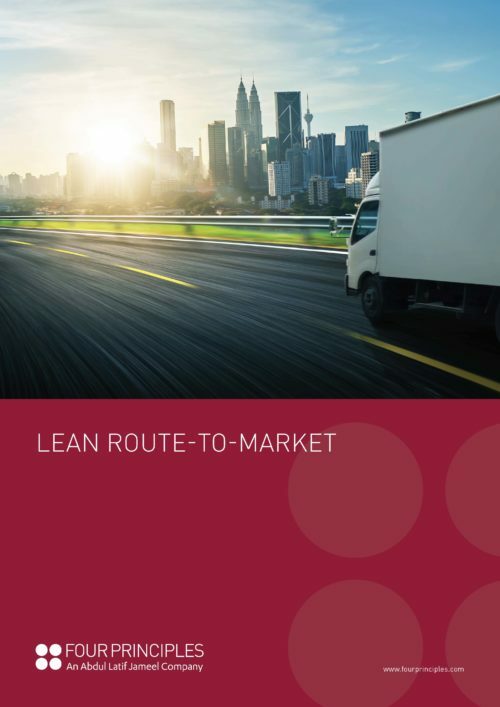 Implementing Lean management to Route-to-Market, Four Principles eliminate unnecessary waste from each stage of the process, giving clients a competitive edge through a number of key strategies. S&OP processes are improved; revenue is increased without sacrificing profit and the correct distribution solutions are identified. Moreover, Lean RTM enables improved management of human resources, enhanced stock-keeping / monitoring capabilities and optimised utilisation of resources. Enabling greater flexibility, Lean also allows companies to adapt to constantly increasing market complexity – becoming more agile and able to react appropriately to regional changes in social and consumer trends. By reducing order handling, loading and unloading times at the depot, costs are saved – by doing so at the retail site, staff are freed up to spend more time looking after their customers. Assisted by improved information, demand and supply of goods can be effectively coordinated, stock variability reduced and excess stock carry-out at the depots eliminated. Ultimately, though, Four Principles approach to Lean RTM is all about reducing lead times, increasing quality and cutting costs – adding significant value from the customer’s perspective in the process and enabling sustainable, long-term profitability.